Sorry, folks! Haven't had much time in the past week to add the latest news of the cranberry saga. The cranberry-banana batch finally reached the same Brix level as the cranberry-grape after a very slooowwww fermentation (Brix = -1.7, SG = 0.994), so I decided to rack and sulfite to keep the outcome consistent. 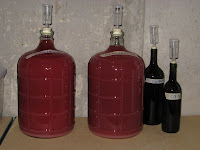 This batch was a comparative breeze to rack as the lees were very compact, although the wine itself is much cloudier. I obtained 3 gal and 2.25 L of wine. I'm keeping what didn't fit into the carboy in some wine bottles for use in topping up during future rackings. Everything received 100 ppm addition of sulfite and 1.5 g of lysozyme to prevent MLF. All of the cranberry is now safely resting in the basement (current temperature is 50-55 °F) and beginning to clear. The cranberry-grape is on the left and the cranberry-banana is on the right in the picture. Yes, I'm pretty low tech with my carboy labels--masking tape and magic marker works just fine for me! You may not be able to tell from the picture, but both wines are throwing a pretty significant layer of lees even after a couple of weeks. Not too much to do on these wines for now, but to sit and wait for them to clear. Ah, the agony of patience!